A rise in stock price is never a guarantee, but here are three of the best reasons why Aflac could see strong growth in the years ahead. While rising stock prices are never guaranteed, looking forward, I believe there are three reasons Aflac's stock price could rise in the months and years ahead. First, despite Aflac's partnership with Japan Post not providing as much growth as expected, longer term, management sees this as a huge opportunity. Second, the aging population in Japan should create greater demand for Aflac's most popular product, supplemental cancer insurance, and thirdly, the Japanese economy has shown significant improvements which should benefit Aflac's stock price. Despite deregulation in Japan allowing for more foreign companies to compete in Japan, Aflac's CEO Dan Amos believes Japan Post Holdings is the only real threat to Aflac's stronghold over the supplemental cancer insurance market. Unlike U.S. postal services that exclusively deliver mail, Japan Post is also heavily involved in insurance and banking -- and is currently ranked number 23 on the Fortune Global 500 with nearly $3 Trillion in assets. It was rumored that once Japan Post becomes fully privatized -- it's currently owned by the government -- it would issue its own supplemental insurance policies. 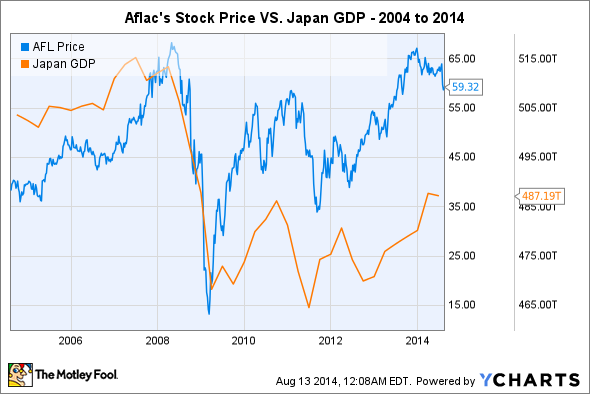 But Aflac announced on July 26 of this year that it would be extending its partnership with Japan Post. This means that Japan Post will increase the number of outlets that sell Aflac's cancer products from 1,000 post offices to 20,000. Moreover, the company is waiting on regulatory approval to have their products sold by Japan Post Insurance (Kampo) that operates 79 sales offices. Taking a long-term view, Amos sees this alliance as a "game changer" and should help grow Aflac's distribution, as well as continue to improve its already dominant market position in the region. According to Cancer.net, "Aging is the single biggest risk factor for developing cancer." Not only is Japan's life expectancy of 83 one of the longest in the world, but according to the United Nations Population Division, more than half of Japan's population is 45 years or older, and the country's median age is predicted to rise to 53 by 2050. Mix longer life expectancy with an aging population and you're going to see a greater necessity for long-term care, and a greater incidence of chronic illness. As the chart below shows, malignant neoplasms, or cancer, has been on the rise for the past 30 years in Japan. Japan's socialized health care system covers most medical expenses. But paying for living expenses during treatments can get extremely expensive -- and that's where Aflac comes in by providing a safety net for customers. With cancer by far the leading cause of death in Japan, Aflac's insurance policies are an important means of long-term health planning for an increasingly older population. Aflac relies on the strength of the Japanese economy if for no other reason than individuals need jobs to pay for Aflac's insurance policies. Although, over the past decade the company's revenue and earnings have had little to no correlation to Japan's gross domestic product, or GDP, Aflac's stock price has followed it almost exactly. Over the past few years the Bank of Japan, in a similar fashion to the U.S. Federal Reserve, has been using monetary stimulus (government bond buying), lowering interest rate to near zero, and promoting structural changes to spur economic growth -- and with Japan's GDP up 3.7% since mid-2012 there's certainly progress. Moreover, Japan has one of the strongest unemployment rates in the world, and Bank of Japan officials believe the firmer labor market should lead to higher wages, and hopefully, spur spending and growth. But this isn't to suggest Japan is completely out of the woods. Per capita, or per person, Japan is still the most indebted country in the world. So, while there is still a lot of work to be done, things are looking up which should benefit Aflac. Aflac's brand name, scale, industry expertise, stronghold over the supplemental accident and health market in Japan, and emerging macro trends discussed earlier, gives the company one of the most desirable competitive positions among today's insurers. For those reasons I believe Aflac is a strong long-term buy and hold, and would be a great fit in any portfolio.